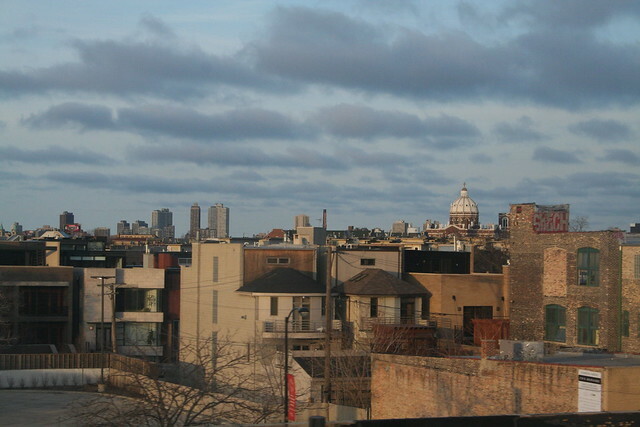 It’s one of Chicago’s most mind-blowing sights – a huge, ornate church with a mighty dome, looking over the freeway, half-glimpsed as one battles through inbound traffic on the Kennedy Expressway. Pity the poor traveler who has never sought out this imposing religious edifice! 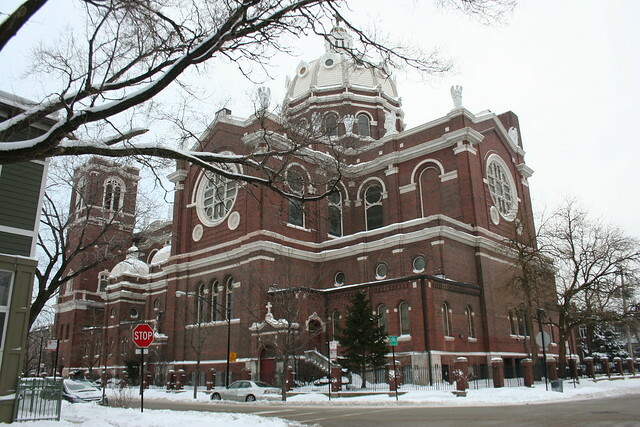 This is St. Mary of the Angels Catholic Church, and it is among Chicago’s greatest architectural glories. Among the Polish churches in this sector of the city, it stands out as the most monumental, the most elaborate in form, and the most fully realized as a work of architecture. The Beaux Arts influence on the front portico is clear – with its grand staircase, massive twinned Corinthian columns, huge doorways, balustraded roof and central terra cotta heraldic ornament, it could easily be a snippet of Pennsylvania Station transported to Bucktown. Moving around, however, the influences become less singular. 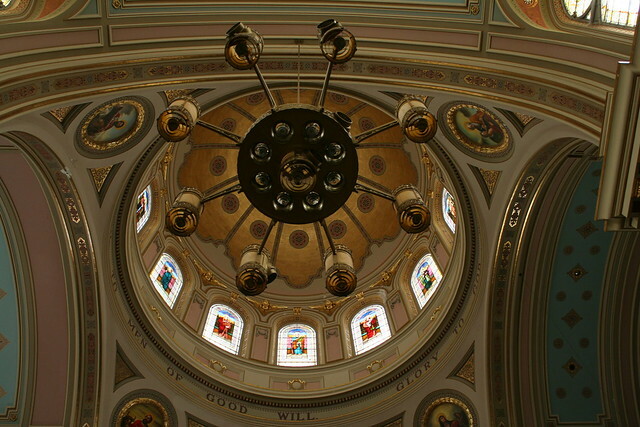 The dome is clearly influenced by St. Peter’s in Rome, but what of those outsize porthole windows? Second Empire, or some Edwardian era flight of fancy? Certainly the square vaults capping the side aisles are not like anything in the Vatican. Regardless, these components make St. Mary of the Angels much more of a building in the round than its predecessors to the south. The other churches we’ve seen feature a highly decorative facade, but are essentially brick warehouses in the back – unelaborated in form or material. St. Mary, by contrast, doesn’t have a bad side – a fact driven perhaps by its double-corner location, which guaranteed that three sides would always be exposed to full view. 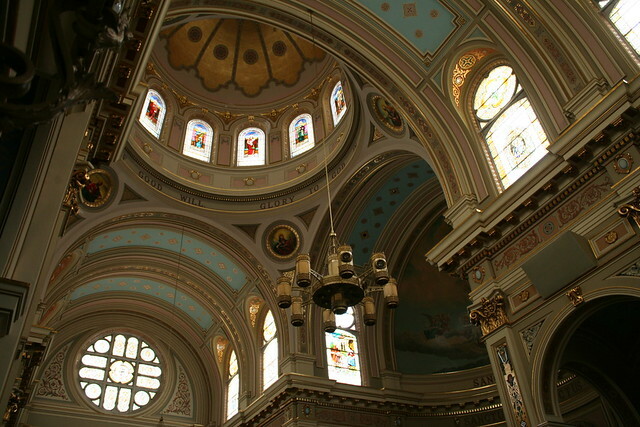 Inside, the church also marks a departure from the earlier Polish churches. It still draws on the same influences, with abundant Roman arches and Greek capitals, painted and stencilled and muraled to glorious excess. 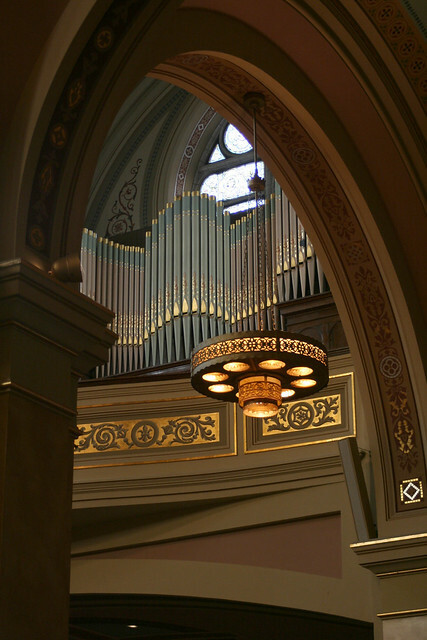 To the casual fan – myself included at times – the architecture of pre-war churches can all start to seem the same after a while. 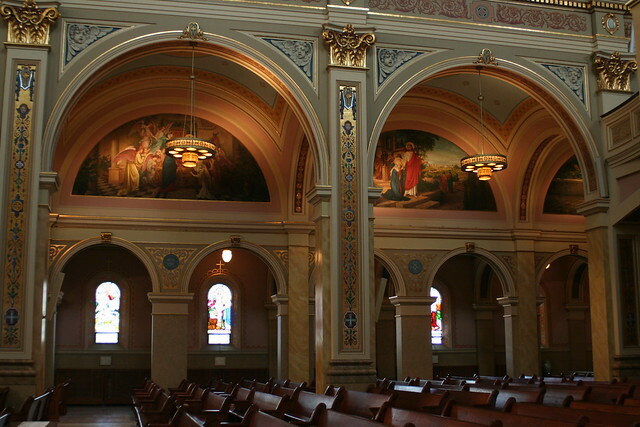 But they are not – some are fundamentally different than others, and St. Mary of the Angels is a fine case in point. 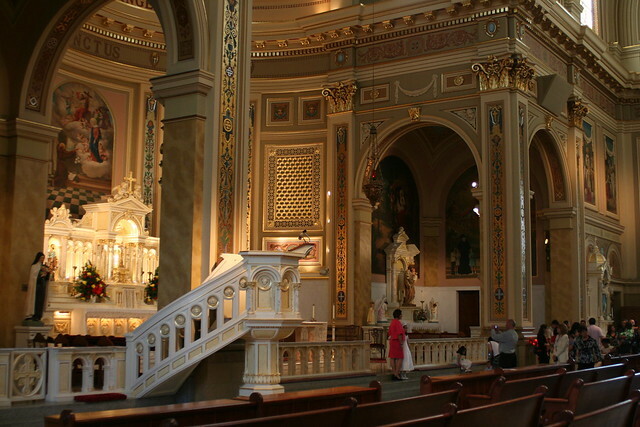 While churches like St. John Cantius and Holy Trinity focused on ever-larger open spaces, with thinner and thinner supports, St. Mary of the Angels seems to take an intentional step back. The enclosed space under its roof is enormous, but it is divided in a way that our other three subjects were not. The primary spaces of the sanctuary seem less concerned with pushing the limits of architectural technology; the arched columns and smaller side aisles create layers to the sanctuary space. They also allow more room for mystery and shadow than the gargantuan spaces of the earlier churches. Brightly illuminated above, the ground level of St. Mary still allows for intrigue and beautiful solitude. 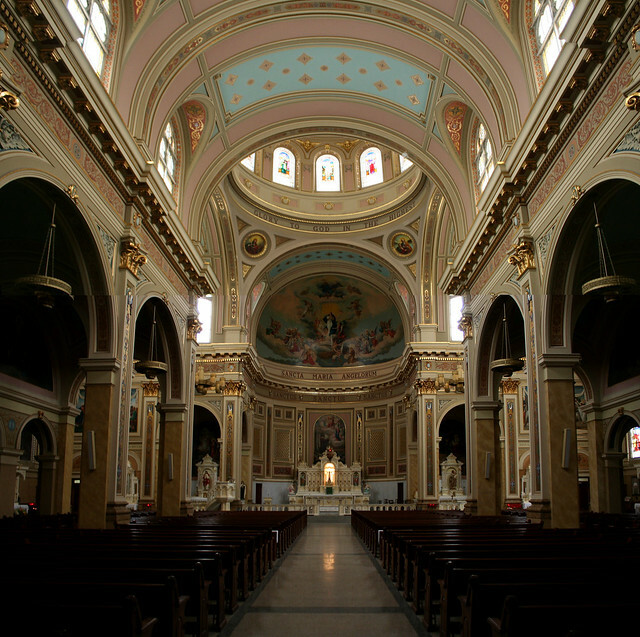 Behind the main arches are smaller arches that define the side aisles; centered in each smaller arch, a window. 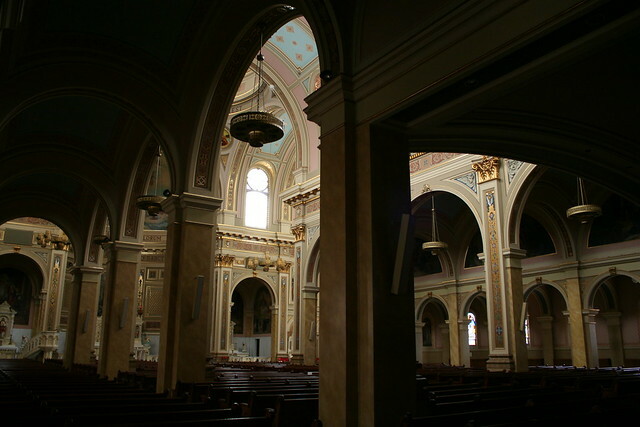 Those curious square vaults cover parts of the side aisles, illuminating them from above with round porthole windows. 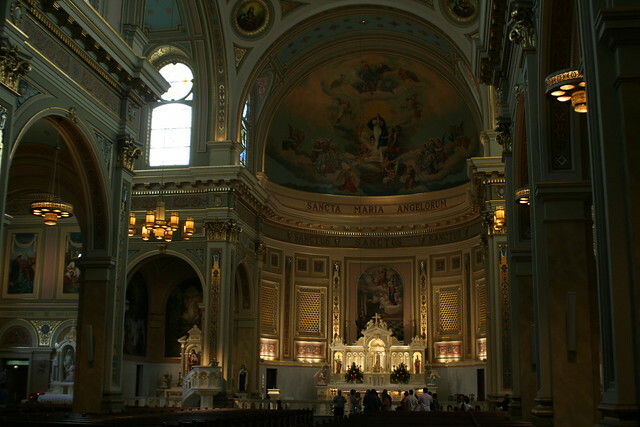 St. Mary of the Angels can seem somewhat conventional in its decoration. In this sense, it pushes no boundaries, and has none of the calculated awkwardness that makes Victorian churches so endearing. But by the same token, it is the most unified, its decoration seeming all of a piece, a complete entity. 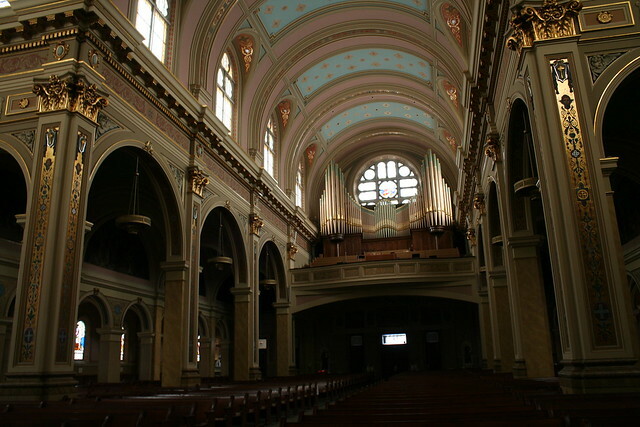 By way of history – St. Mary of the Angels was designed by the architecture firm of Worthmann & Steinbach, with ground broken in 1914 and dedication in 1920. The paintings and stencils were done in 1948. 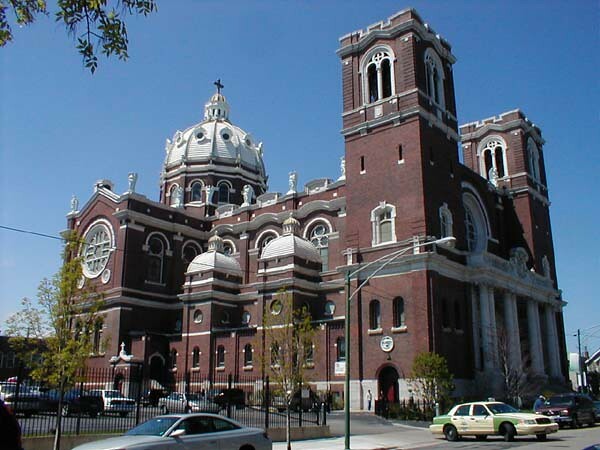 Like its brethren, St. Mary suffered heavy losses as neighborhoods were destroyed to make way for the Kennedy. 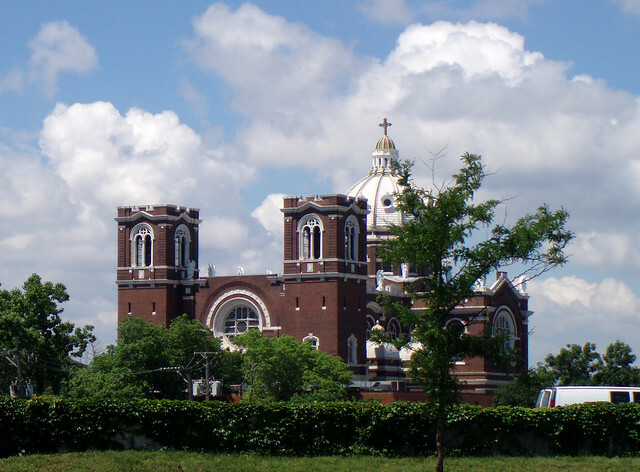 Closed in 1988, it was officially marked for demolition – an announcement that came only a week after Holy Name was similarly marked for razing – until its own parishioners rose up in opposition. Two years of grassroots fundraising followed, gathering the money needed for restoration of the building, which occurred from 1991 to 1999. Since then, the number of families in the parish has increased, and the church’s future seems brighter. 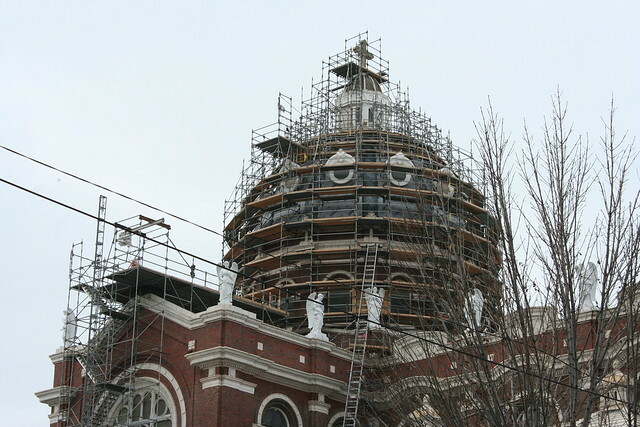 A more recent restoration of the dome was completed in 2011, following another fundraising campaign. 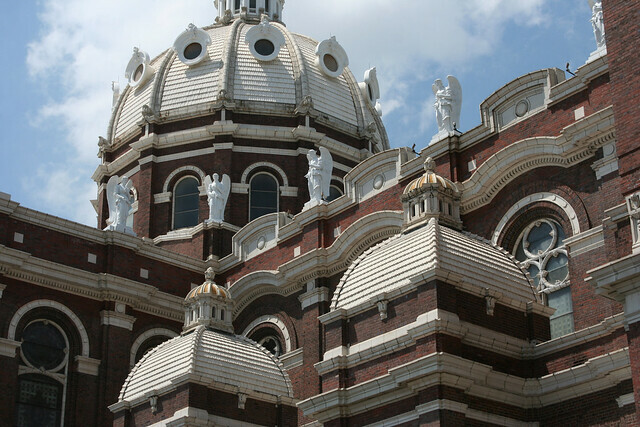 Thanks to the tireless efforts of its congregation, St. Mary of the Angels continues to be one of Chicago’s greatest neighborhood landmarks. This entry was posted in historicist churches, Pre-war churches. Bookmark the permalink. A beautiful and informative post. I’ve been here several times with my girlfriend who is Catholic (I’m Lutheran). I’m always struck by the immensity of this church. Your review makes me appreciate the church all the more. Insightful observation that the church looks good from all sides. I grew up in this church from the 60’s until the 80’s. I did my confirmation and confession plus everything else that goes along with that. 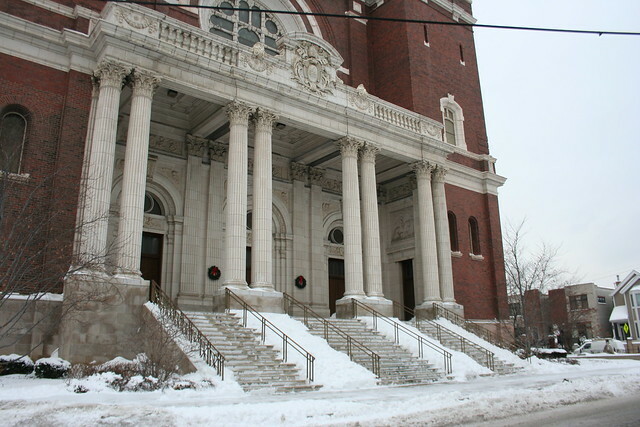 I grew up two blocks from the church and can say that it was one of the best times of my life. 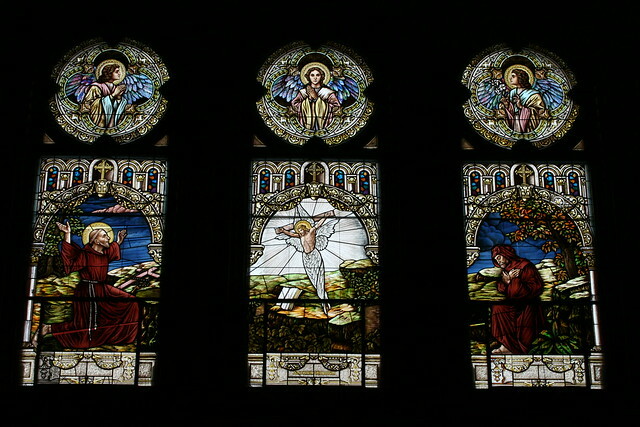 My relatives donated monies to bring back the angels and glad they did. What a wonderful place to grow up in and around, life was simpler and people were just so kind back then. I believe the parishioners received a huge assist from Opus Dei with the fundraising. In 1991 Cardinal Bernadin turned the parish over to Opus Dei in an attempt to bring in more parishioners. 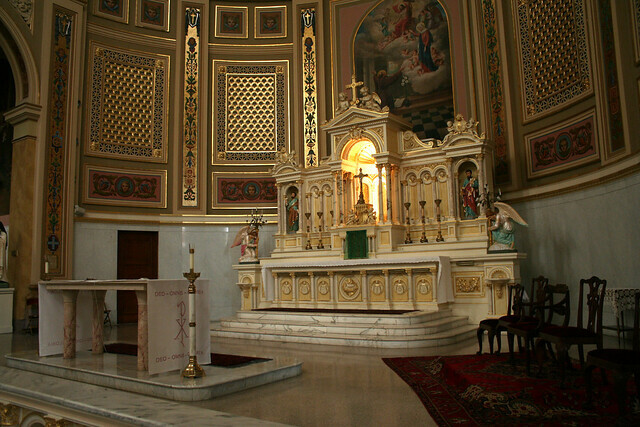 I was aroun that time he also approved of the Extraordinary Form of the Mass for use at St. John Canitus for the same reason. That Opus Dei takeover was caught on videotape in 1991… not good memories.